DC Comics has made an interesting choice with their Rebirth initiative. They have created two separate Green Lantern comic series. There is the quintessential Green Lantern storyline—Hal Jordan and the Green Lantern Corps. This series takes readers into the deepest reaches of outer space and follows such classic Green Lanterns as Hal Jordan, John Stewart, Guy Gardner and Kyle Rayner. Then, there is the Green Lantern storyline which takes two rookie Green Lanterns (Jessica Cruz and Simon Baz) and finds them in defence of Earth and its surrounding system. This comic is titled Green Lanterns and is not as flashy of a premise as Hal Jordan and the Green Lantern Corps, but it still offers an interesting look at what it takes to be a Green Lantern. In Green Lanterns #16-17, these two rookie Lanterns must learn to play nice with a rather surly superhero. Green Lanterns: Darkest Knights partners Cruz and Baz with the darkest knight of them all—Batman. 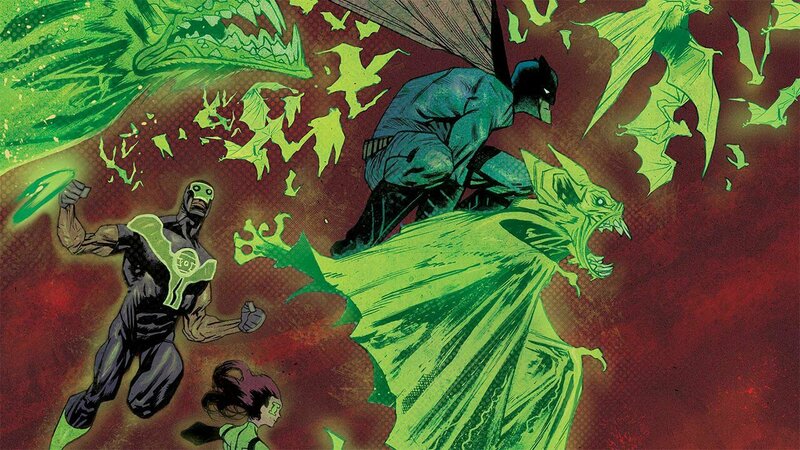 Green Lanterns: Darkest Knights begins with Cruz and Baz being summoned to Gotham by Batman. The three are in the Justice League together, so there is a familiar connection. Batman needs the two to help him solve a mysterious crime wave hitting Gotham. The Caped Crusader is running short on time. Bane is heading to Gotham, and Batman has tried to send his closest allies away for fear of Bane’s reprisals (see my Batman: I Am Bane review for more). There is a surge of fear hitting the streets of Gotham, one for which Baz arrogantly states the obvious: this is a sign of the Scarecrow. But Batman has brought them here not for the obvious; there is a greater threat, one which is in the form of another power at play—the yellow ring from the Sinestro Corps. Green Lanterns: Darkest Knights is a surprisingly effective and entertaining two-parter. Writer Sam Humphries does a great job utilizing the Dark Knight to his maximum, as this isn’t Batman’s comic series. Yet, smartly, the Caped Crusader isn’t in this series for just a cameo. Batman has a major role to play in Green Lanterns: Darkest Knights. As well, bringing in a classic Batman villain—the Scarecrow—greatly assisted the story, further exploiting the Batman world. Although the story is narrated by Green Lantern Baz, it’s essentially the Green Lanterns visiting Gotham and trying to play nice with Batman. Handling the illustrations for Green Lanterns: Darkest Knights is Neil Edwards and Eduardo Pansica. 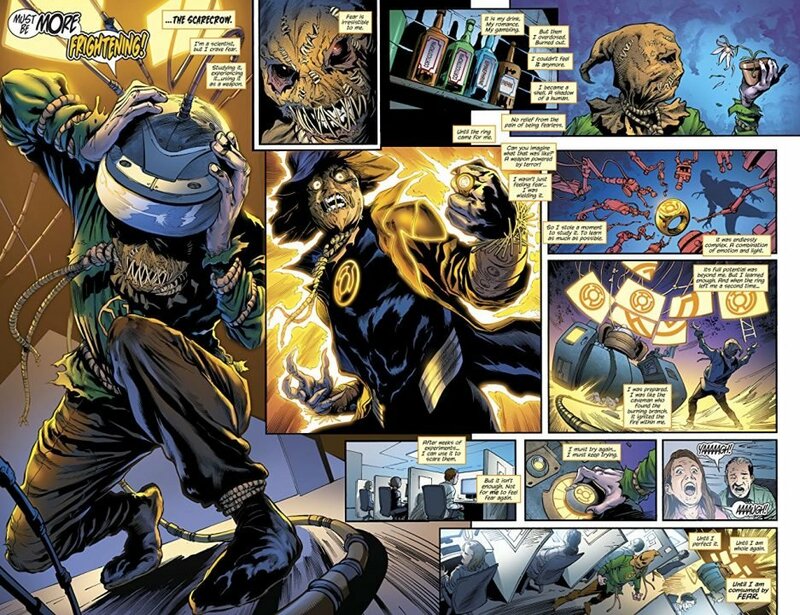 While the artwork was done with one artist per issue, the two illustrator’s styles weren’t too dissimilar, never a jarring transition from issue to issue for the reader. Edwards and Pansica do a good job with both action sequences as well as character emotions, bringing the reader further into the rookie Green Lantern’s first one-on-one experience with the Dark Knight himself. One of the biggest surprises of Green Lanterns: Darkest Knights was the depth of character written within only two issues. Baz and Batman have an issue. Baz carries a gun with him at all times—he believes one can never have too much backup. As readers of Batman know, he has an issue with guns. The two don’t see eye-to-eye on the subject. But as the story progresses, Baz carries the gun to mask his own insecurity. At times, he can’t control his power ring. It is this insecurity, and the courage to move beyond it, which is the emotional core of Darkest Knights and the most surprising and successful part of the mini-series. In short, Green Lanterns: Darkest Knights is worth picking up for both the depth of story in such a short series and the Batman. As all DC fans know, you can never have enough of the Bat. Green Lanterns: Darkest Knights is a great mini-series, combining emotional depth with the darkness of the Batman, Gotham City and the fears educed by the Scarecrow.